How to Make a Game App - Create a smartphone game today! With a global market generating $100 Billion this year, it’s no wonder that many people want to get in on the game app action. But getting rich off of the App Store is only one of the many possible motivations! Who knows, you could simply be interested in creating something fun for your friends, or actually building a lasting piece of digital art. 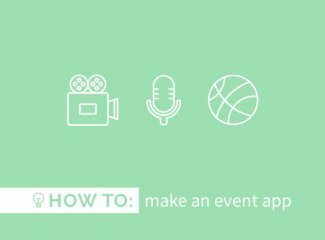 Whatever the reason, this quick guide will show you what tools you can use to create a video game that’s playable on iOS and Android. Please note that we also have a complete overview of different game engines here, some of which even allow you to create games for consoles and desktop! So what do I need to get started? A computer: you will need to install the game engine on your PC or Mac. Note that some game engines are only PC or only Mac. They don’t work on both. A smartphone (or two): you will need to test the game on your desired platform. It’s worth ensuring it plays nice on both an iPhone and an Android phone if you want to reach both markets – and it’s worth trying on low end devices too! A developer account: to submit your game app. It costs $99 per year for the App Store and $25 for life with the Play Store. Unlike with app makers, you’ll be in charge of updates and making sure the game works on all devices. This could mean several new updates per year. A way to create art: Whether you are going 2D or 3D, you will need game assets. You can find a ton of free resources online and some game companies have got their own marketplaces. But the best way to make your game stand out is to create things like the characters, background, music and menus yourself. And a game engine too? Game templates: the easiest way to get started – and also the most limiting. You won’t be able to change anything about the game except the characters, backgrounds, music, that kind of thing. In short, the mechanics of the game cannot be tweaked at all. For example, AppyPie or ChupaMobile offer templates (these are online solutions, by the way). Drag and drop: this is the best method for beginners. You have a list of behaviours (if this happens, then that happens) and you can just apply them to your game objects. For example you create a 2D square and create a behaviour that says “if I press on the screen, the square jumps”. Visual scripting: a more advanced solution that gives you all the flexibility of code without having to code. 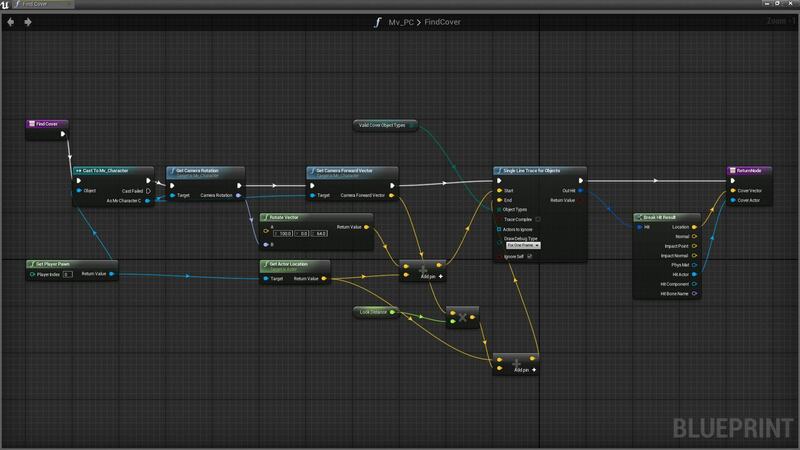 You basically create “nodes” that represent actions or events for your game objects. This creates a kind of diagram that represents everything happening in your game window. Coding: the pros will tell you this is the only serious way to get complete control over your game, especially if you want it to be complex. And if you’re interested in a career as an game developer, you might as well start learning while doing! The good news is that some game engines offer their own simplified scripting language that makes it easy to grasp the basics for beginners. Can I make any kind of game? More complex 3D game genres such as FPS (first person shooters) or a MMO (massively multiplayer online games) will not only require some code, but they are also not necessarily the best suited for playing on a smartphone or tablet. Which game engine should I choose? This is the big question, and obviously it will completely depend on your level of skills and the kind of game you want to make. But below is a quick overview of some of the engines we think would be the best suited for you, listed in order of complexity. GameSalad falls into the drag and drop category, and it features an intuitive interface as well as very good documentation for beginners. The way it handles 2D physics is perfect for mobile games, and it’s worth noting that you can publish your results to iOS, Android and even desktops. They also have a “mobile viewer” app to let you test your game on different mobile devices! 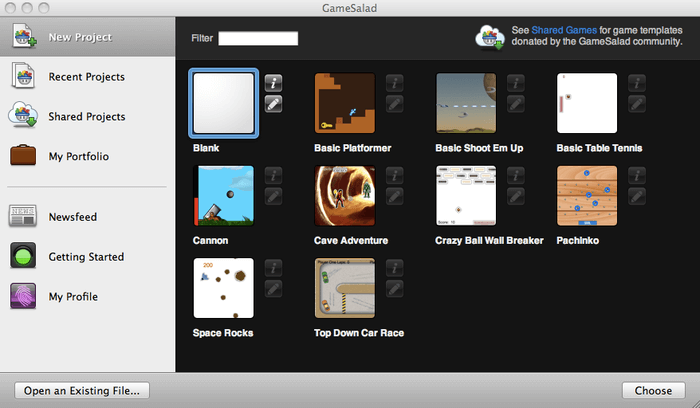 Watch how to get started with GameSalad in 15 mins. Main features: drag and drop, game physics, good documentation, has marketplace, comes with basic game templates. Ad monetization supported with the pro version ($25 a month). The basic version is $17 a month, but you get 50% off the pro plan as a a teacher, student, or military personnel. 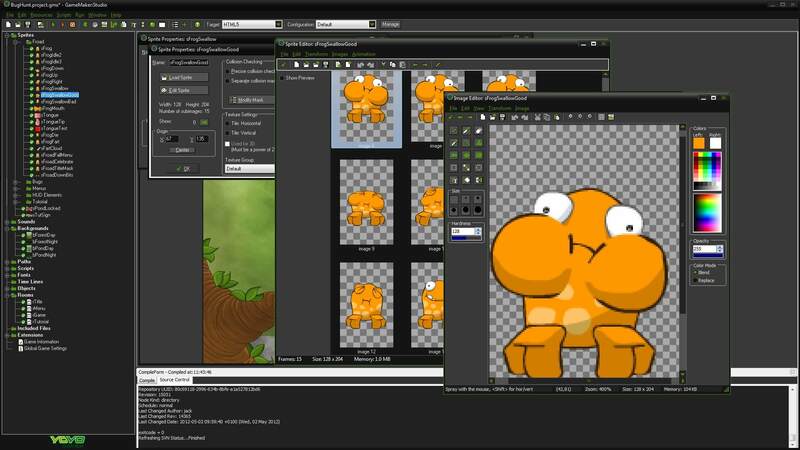 Using visual scripting, GameBuilder Studio might be a bit more intimidating than GameSalad, as can be demonstrated in the tutorial video below. However the documentation seems equally good and exhaustive, and you can even take a free udemy course online to get started with the basics. The program is also fairly cheap, costing a full price of $99 for the pro version, and $199 per year for the pro plan with all the features + tutorials and extra plugins. 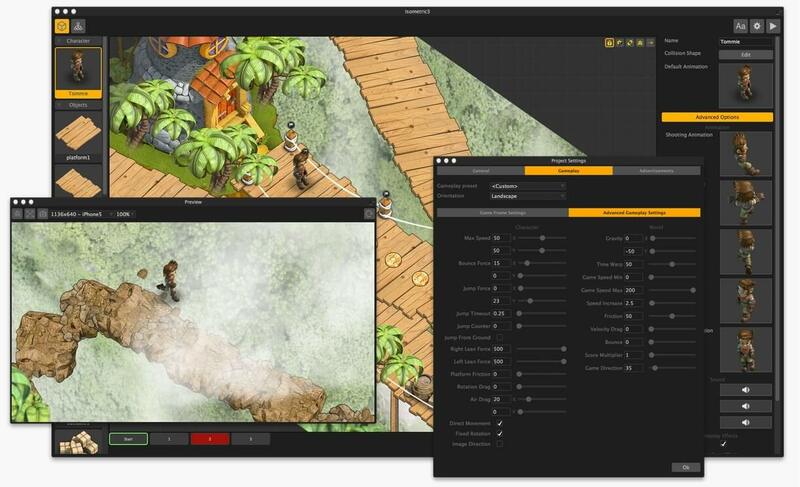 Main features: visual editor, game physics, plugin marketplace, good tutorials, create 2D animations (or integrate with Spine for powerful 2D animations). Ads, multiplayer and other advanced features are supported with the Pro version. This one is a newcomer on the game engine scene, but it’s making big claims. Buildbox has listed 100 games made using their platform that entered the top downloads in the App Store, including classics such as The Line Zen and Color Switch. It is drag and drop, and also comes with some basic templates to get you started. On the plus side, the interface is really nice and the features seem very robust, if a bit limited. On the downside, the subscription is very expensive ($99 a month or $84 if paid yearly). 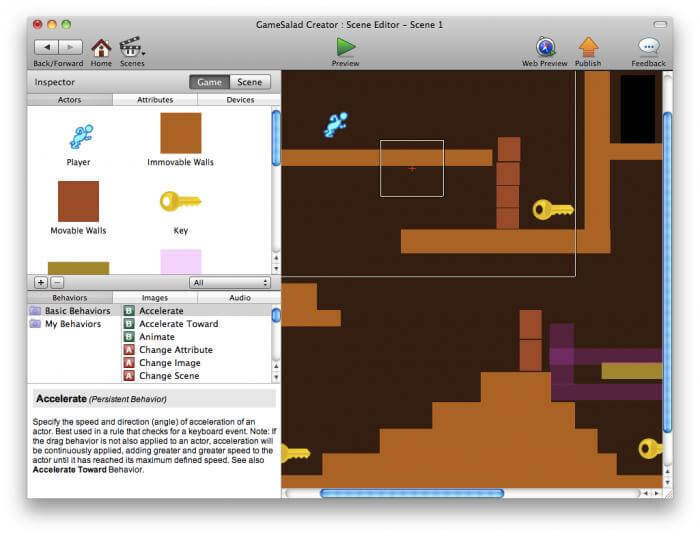 Main features: drag and drop, game templates, great UI, 2D graphics (sprites) editor and animator. Moving on to the drag and drop and visual scripting method now, ClickTeam Fusion has been helping people create games since 1994! It is worth noting that they are not exactly focused on mobile games, and in fact you will have to pay extra to build your game for iOS and Android. However, one big pro of the program is that it has a big and enthusiastic online community, so you should be able to find the answer to any question you have about how to create your game. It also has a visual editor so you can create art directly in the program. Oh, PC only though. Main features: drag and drop, visual scripting, PC only. Good online community and tons of extensions available. We now reach GameMaker Studio 2, a powerful solution that created hit games such as Hyper Light Drifter and Hotline Miami. 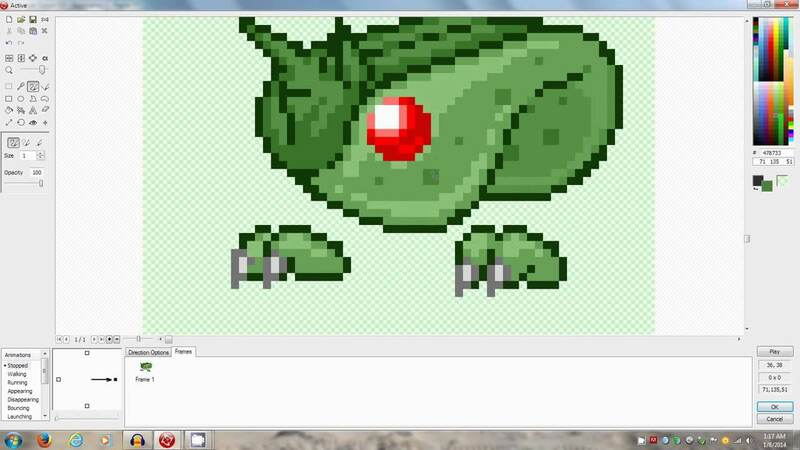 On the plus side, it comes with a visual editor so you can create and animate the pixel art directly into the program, making it the engine of choice for artists. On the downside, you will need to code. Luckily, they use their own simplified language called GMS2. The documentation is also excellent. Like ClickTeam Fusion, it is also geared towards desktop computers and consoles, and you will have to pay for the full version ($399) to export your game to Android or iOS. Try GameMaker Studio 2 here. 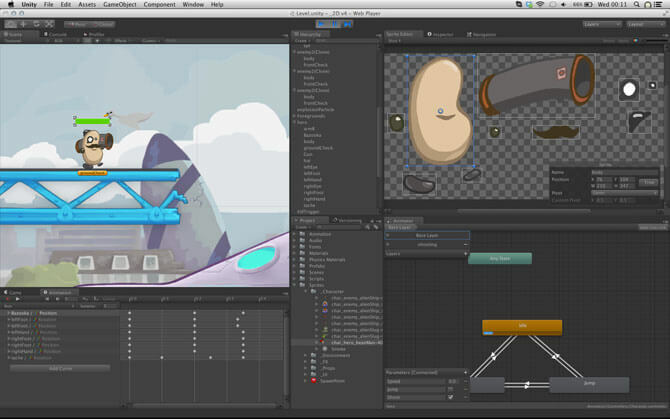 Main features: visual editor and animator, simplified code, powerful features. Excellent marketplace full of assets and extensions. 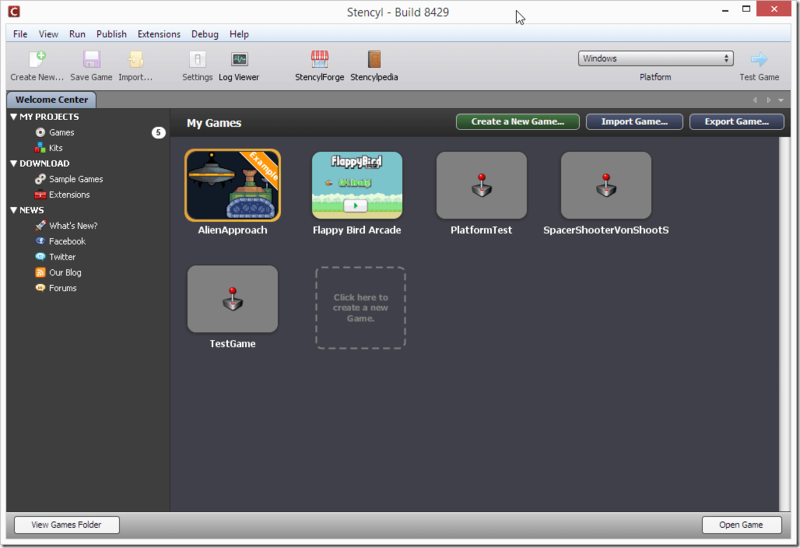 Stencyl is an interesting engine based on the MIT Scratch project. A few years ago, MIT (the Massachusetts Institute of Technology) developed a visual programming language to teach students how to code, and it is the same method that Stencyl uses. The elements are designed to fit like a puzzle so you will get a good understanding of how code works when you learn it. While it isn’t exactly a powerful engine, it’s definitely a great solution for simple 2D mobile games, and it seamlessly exports to iOS and Android. Main features: visual scripting language, good for learning how to code, subscription model ($199 a year to publish to mobile platforms and desktop). You’re now looking at a very powerful engine that uses a known scripting language (C#). By the way, you will be in company as Unity is the engine used by a ton of indie companies as well as AAA studios, from games such as Temple Run to Assassin’s Creed. And the good news is that you won’t necessarily have to code to create your game in it. This is because you can find a number of plugins for Unity that use a visual editor. These solutions are not always beginner friendly, but it's a start. 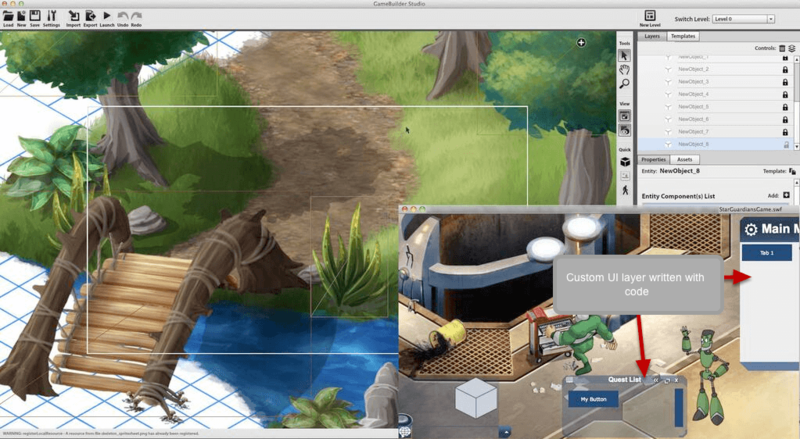 They include FlowCanvas, uScript, Adventure Creator or PlayMaker. And Unity not only lets you build to iOS and Android, but you could also port your game to consoles and desktop! The main competitor to Unity, Unreal is also a powerful engine used by AAA studios for games such as Abzu and Kingdom Hearts III. It comes with a visual editor called Blueprint, and it’s known to push the limits in terms of beautiful graphics, even for mobile games. 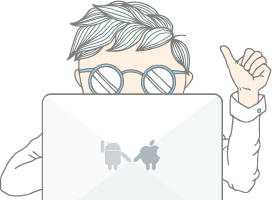 Like Unity, you can publish your game to desktop and consoles as well as iOS and Android. The downside is that Unreal created quite heavy games that target high-end mobiles. It's also a complex beast that you will need months to understand and get to grips with. Main features: comes with visual editor, good for big mobile games, free to use and 5% royalty if your game makes more than $3000 per quarter. In conclusion, it’s worth noting that there are many levels of what you can call “a game app”. If you want to use a ready-made template, you can. If you are more serious about game development, it’s also fully available to anyone with a computer, a bit of time, and online resources. And there seems to be more and more solutions available all the time. So the good news is that you won’t necessarily have to code to create your smartphone game, especially if it’s a simple one. And the better news is that the best games, especially in the mobile world, are not necessarily the most complex! Any questions? Feedback? Would you like us to feature another solution for creating game apps? Let us know in the comments below!